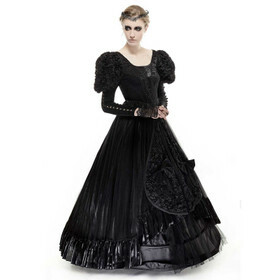 Richly victorian style ladies' jacket by Punk Rave. Black velvet contrasts. High stand-up collar. Richly detailed victorian style ladies' jacket by Punk Rave. Shiny rayon-mix fabric with decent flower pattern and tiny stripes flock. Satin lining. Black velvet contrasts. Stitched button front. High stand-up collar; round ruffles of lace and organza. Lace up back and little ruffle tail. Sleeves with lace cuffs.